Posted February 12, 2012 - The Vietnamese Gold story proofs one cannot and may NEVER trust Government. Gold is money, and sometimes much better money than governments offer. Because of that, governments seek to control gold and its price. A negative real rate of interest -- what in the West is starting to be called "financial repression" -- pushes people out of government currencies and into gold. The gold price is much higher when people take delivery of the gold they purchase and don't have access to or participate in sophisticated gold derivative markets, such as the derivative markets in the West. People will participate in black markets if governments try to suppress public markets. And as a Vietnamese sociologist says here, "Empires may fall, currencies may change. ... Gold will always survive." HANOI, Vietnam, Friday February 5, REUTERS -- The price of gold in Vietnam dropped by more than 5 percent on Friday from the day before after the central bank told the country's biggest maker of gold bars to sell bullion to help narrow the gap with world prices. Saigon Jewelry Co. (SJC) sold 28,000 taels of gold (33,880 ounces) on Friday compared with 10,000 taels on Thursday, a company official said by telephone from Ho Chi Minh City. "The state bank has asked SJC to sell gold so that prices can be stabilised in line with the world market," said the official, who declined to be identified. Gold was quoted at around 24.9/25 million dong ($1,353.60/$1,359) per tael at around 1000 GMT, about 5.4 percent lower than the 26.37/26.43 million dong quoted late on Thursday, according to SJC's website (www.sjc.com.vn). Gold prices in Vietnam have been higher than world prices because imports are controlled and taxed, and sellers charge a premium for the commodity, which is widely used as a second currency and reserve of wealth. On Friday afternoon, after the price fell, gold in Vietnam was still higher than world prices by about $63 per ounce, or 6 percent. A central bank statement later confirmed that it ordered SJC to sell gold and said it would "apply necessary supportive measures" during the process of stabilising gold prices. It did not give further details. On the world market, gold prices hovered above three-month lows on Friday, a day after after posting their biggest one-day loss since 2008, with investors wary of taking risks amid mounting sovereign debt fears in Europe. The amount of gold SJC sold on Friday was relatively large. By comparison, on slow trading days it sells 4,000-5,000 taels, the official said. When gold prices soared to around 29 million dong per tael, in early November, SJC was also ordered to sell bars and it offloaded 16,000 taels per day, he said. He did not say how long the firm would sell at high volumes. The nation is preparing for the Lunar New Year, or Tet, its biggest festival of the year. The government has committed to keeping prices stable and currency flowing during the period when there is traditionally a surge in consumption. The central bank's decision also follows government orders to close all of the country's roughly 20 gold floors, which deal in non-physical gold and allow margin trading, and overseas trading accounts. Traditionally, the Vietnamese use Gold for savings, jewellery and real estate transactions but when inflation is high, many choose gold to hedge against inflation. HANOI, Nov 11 (Reuters) - Vietnam's central bank on Wednesday lifted a 1-1/2-year-old ban on gold imports in a bid to stabilize the market after a sharp rise in prices helped drive the country's dong currency to a record low. "The State Bank of Vietnam will allow gold imports with a volume sufficient to intervene in the market in order to stabilize the market, combat speculation and prevent an impact on the interests of the people," the central bank said on its Web site, www.sbv.gov.vn. Five or six companies would be allowed to import unlimited quantities of gold, state-run news Web site VNexpress.net quoted State Bank of Vietnam Governor Nguyen Van Giau as saying on Wednesday afternoon. He did not give details or a timeframe. The ban on gold imports since May 2008 led to a gap between domestic and international prices, and recently traders say that spread, plus the rise in gold prices globally, triggered a surge in demand for dollars. "This morning the prices and the market went crazy, the worst time in my 20 years of trading," an owner of a gold shop in Hanoi's downtown district of Hoan Kiem said. "Prices collapsed this afternoon and the decision on gold imports will certainly help control the situation." By early afternoon on Wednesday the dong hit 19,800 per dollar -- about 7 percent lower than the rate a week ago -- before rebounding to around 19,000. Vietnam shows interesting in monetary developments. The local currency, the Dong, is not an internationally exchangeable currency and is moving in the direction of the Zimbabwe dollar. The first thing that made an impression was a question on the Vietnamese arrival form. Immediately following the normal question: "Are you carrying more than $10,000 in cash or convertible currencies?" was another question: "Are you carrying more than 300 grams of gold? If so, list the gold that you are carrying." Virtually all trade in Vietnam can be conducted in either Dong or in US Dollars. Every Vietnamese can instantly quote the price in either currency. The locals spend Dong while US Dollars are hoarded. Gresham's Law is alive and well in Vietnam. 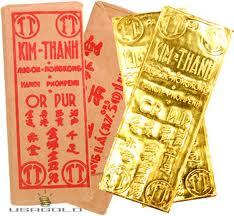 The Vietnamese are also well versed in the benefits of holding gold as "good" money. This article suggests that the Vietnamese people hold a total of 700 tons of gold, a huge amount for such a small country. Zimbabwe is still number one "inflation" story of the year; however Vietnam is starting to write a similar one. It comes as no surprise that another dollar-linked or semi-pegged currency has collapsed vis-à-vis gold. As usual the weaker economies have to give in before the stronger ones do. Which one will be next!? Vietnam’s 27 % inflation level has yet to reach the vertiginous levels we see in Zimbabwe but the country is experiencing every problem that causes a rush into precious metals. Interest rates are over 8% and rising, the stock market was down every day since May, and official unemployment has more than doubled and reached 5.1% this year (Spain has 10,2% unemployment). The real spending power of household has drastically declined. The Vietnamese stock market index has collapsed all the way to the base from where the parabolic rise started (200) and Real Estate is coming down in sequence. In Vietnam, people are reacting in a different way than in Zimbabwe. The main reason being that the population in Zimbabwe had and has no or little access to Gold. Vietnam (Indochine) was a French colony and it has, like all colonies have, inherited the French way of living. French people traditionally jumped into gold in times of economic and financial hardship. They were over and over again trained by history…and have not forgotten their lessons. Hence it is no surprise Vietnam’s economic and monetary problems have sent its people fleeing into gold. Not gold stocks... but physical gold bullion. They're hoarding it and hiding it from their government. Only about 10% of what Vietnamese hold in Gold has been deposited into banks (which actually pay 2.5% interest on gold). The remaining 90% is likely under mattresses or hanging around the owner's neck. The trend toward gold is spilling into other financial areas. After a long period of quoting land prices in Vietnamese dong (the nation's currency), landlords are now setting prices in gold in order to avoid the devaluation. The Vietnamese economic miracle, averaging a stunning 7.3% GDP (gross domestic product) growth rate this decade, is abruptly coming to an end. Austrian economists would classify the Vietnamese economy as a HOCG economy. What happens here and now is completely in line with the theory as explained by Ludwig von Mises. Ironically, and as expected, since June, the Vietnamese can no longer buy gold. Officially, the government claims this new policy is to temper booming imports, which resulted in a record trade deficit for the first half of 2008. Next step, as Vietnam continues to lose control on inflation and the economy, gold confiscation becomes a real possibility. 1. Vietnam Suspends Gold Imports, Follows FDR's Great Depression Lead - July 04, 2008 - by Eric Roseman: It seems Vietnam just borrowed a page from the U.S. financial-history books - by suspending all gold imports in June. This marks the first time a Southeast Asian country has ever barred gold imports during skyrocketing inflation, soaring interest rates and an overvalued currency - the Vietnamese dong. 2. Vietnam's communist authorities have temporarily suspended all gold imports in a bid to tackle the country's spiraling trade deficit and help support the depreciating local currency, the dong. With Vietnamese investors rushing into gold as a hedge against skyrocketing inflation, Hanoi - which sets an annual quota for gold imports - has withdrawn licenses for further imports, traders said yesterday.